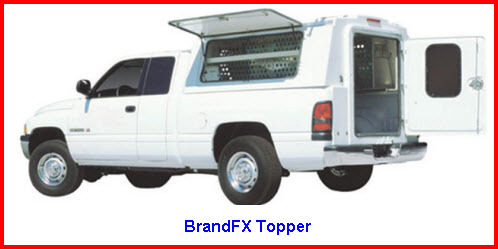 BrandFx Toppers, Inserts, Line & Service Bodies are made of FX fiberglass. 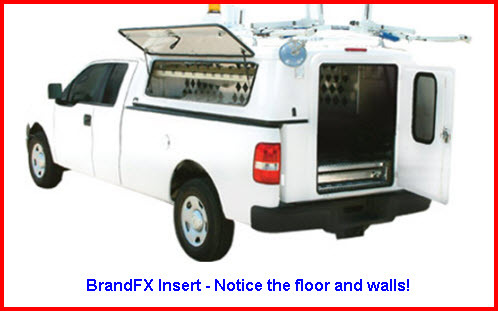 BrandFX Toppers are manufactured by SNF, Inc. Corporate HQ is in Fort Worth, Texas and the company has over 1,000,000 square feet of manufacturing space and 300+ employees spread throughout the US, the Caribbean and South America. SNF Inc. makes commercial truck toppers, truck inserts, line bodies and service bodies. These products are all made from FX composite fiberglass (fiberglass laminates with a PVC core) like the stuff they use in military vehicles, race cars, race helmets, sky diving helmets and sailboats, just to name a few applications for FX fiberglass. FX doesn't rust, weighs 50% less than steel and doesn't rust. This FX stuff is durable, strong and last way after the steel starts to rust away. And it's Green! Since it weighs a lot less than steel, it saves on fuel. Here's a little info on each of the major product lines. - Fits Cab to rear Axle (CA) 39-51", 56", 60", 84"
- Tailgates & tailshelfs, so you can tailgate, of course!